Learn how sports psychology strategies can boost your athletes mental toughness in sports with Dr. Cohn’s free mental toughness reports for specific sports. Find the report you want from the list below and download at Peaksports.com or Youthsportspsycholgy.com. Hope you enjoy! Golfers and Instructors: Improve Preshot Routines. Baseball and Softball Players and Coaches: Improve At-Bat Routines! Tennis Players: Improve Between Point Mental Toughness! Hockey Players and Coaches: Improve your Pregame Mindset! Equestrians and trainers: Improve Rider’s Preshow Mindset! 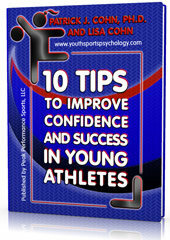 Parents & Youth Coaches: Boost Kids’ Confidence and Success!